Hollybeary Creations : Stuffie Gang!!! Happy Friday everyone.. 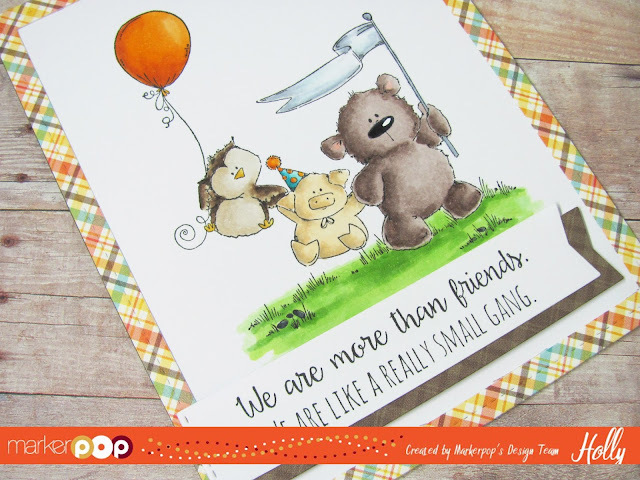 I'm up on the MarkerPop blog today with the Stuffie Gang from Stampingbella!!! And a tutprial on how to use the Copic Color Charts to coordinate your pattern papers and stamped images. I colored in this super cute The Stuffie Gang Stamp from Stampingbella using my Copic Markers. If you love coloring with your Copics and like to have a coloring guide these stamps are great for that. They have a full color photo on the front of the package which is great for a guide. Another great way to figure out what colors to use is a Color Chart. Copic has a great Blank Color Chart on their site that you can color in with your Copics, so you have an extact match. I use the color chart to match pattern papers I want to use with my project with the colors I will use on the images. On today’s project I started with the pattern paper and used the chart to find the colors that matched and then based my Copic choices on those colors. Here I have a piece of the Lawn Fawn Perfectly Plaid Petite Fall 6×6 paper. I’m matching the Orange color in the paper using my Hex Chart. You can use any chart that you hand colored to find your colors. I’m going to use YR12 as my lightest orange color. You can do this with a Colored image on a stamp package too. You will have a general guideline of what colors they may have used or are recommending. For the Brown colors I’m going to use E44 and it’s coordinating colors. Once I knew which colors I needed to match the paper I started coloring the image. The image is stamped onto some Copic X-Press it blending card stock using Lawn Fawn’s Jet Black Ink. I colored the image in and then I added a Frame from the pattern paper that I die cut with the Lawn Fawn Stitched Rectangle Frames. Then I adhered the panel to a top folding card base. I stamped the sentiment onto some White card stock and die cut it using the Blueprints #27 Die-namic from MFT. Then I cut an additional banner from some the coordinating patter paper and added that as well. Super cute, I need to get more of these out of my stash and color this month! I used the following Copics: YR12, YR15, YR18, E40, E42, E44, E47, E49, Y21 & YR23. YG11, YG13, YG17, E50, E53, W3, E70, E71, E74, E77. C6, C9, 100, BG0000, BV20, C1, C4, BG11, BG45, BG49. Be sure to head over to the Marker Pop Blog and find out how you can enter to WIN one of our Copic Marker 30th Birthday Celebration Prizes valued at $300!!! I love your Stuffie Gang card and coloring!!! Your attention to match the papers is a great idea and you are a master at coloring! !